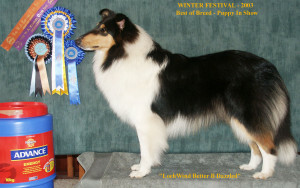 Logie nearly did not come into this world. Born with no signs of life, I rubbed her with a towel for so long, I thought her skin would come off. Just as I was putting her little body down to give up, she drew a huge gasping breath. My little Logie has been with me ever since, my special girl. Out of Ch Highcroft Calienté . 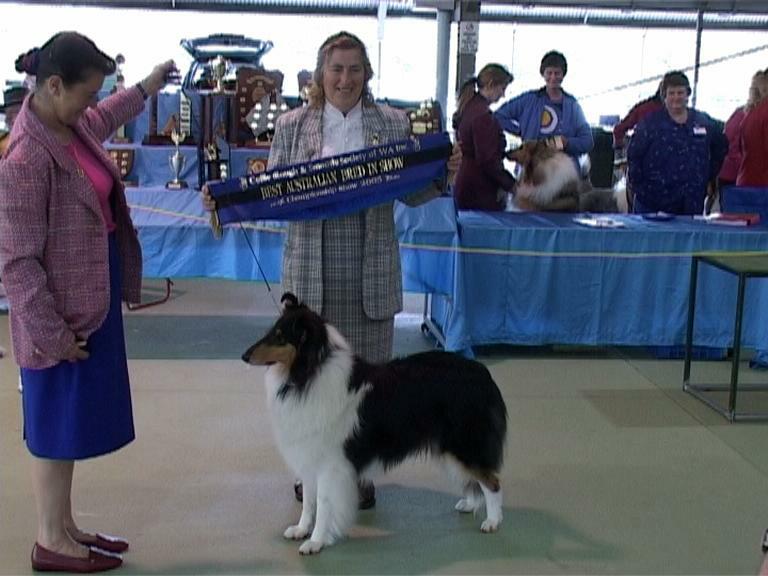 From the day I first put a lead on Logie, she was a born show dog. She stood back at the end of the lead, threw her head back and showed her heart out. Been here before, perhaps ! 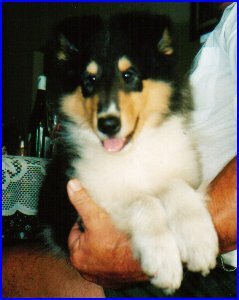 At the tender age of eight months, Logie hit the big time. At the prestigious Winter Festival held on 12th & 13th July 2003 under a panel of International judges, Logie garnered BOB for 25 points over Grd Ch Barcoo Chief Among Braves. 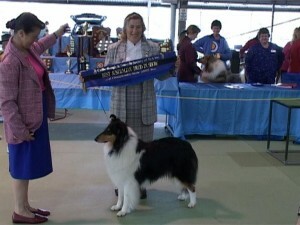 Best Puppy in Group under Mrs D Buxton (USA) then went on to take Best Puppy In Show under Mrs Honey Glendinning (Canada). Best of Breed & Australian Bred In Group. 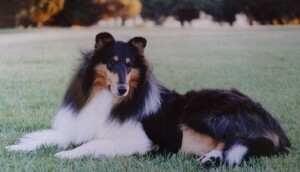 2005 Western Classic. 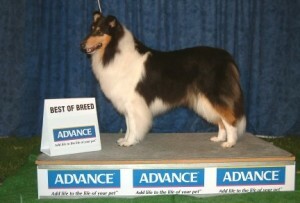 Entry of 48 collies. Judge: Dr Reeves Newson – Canada. 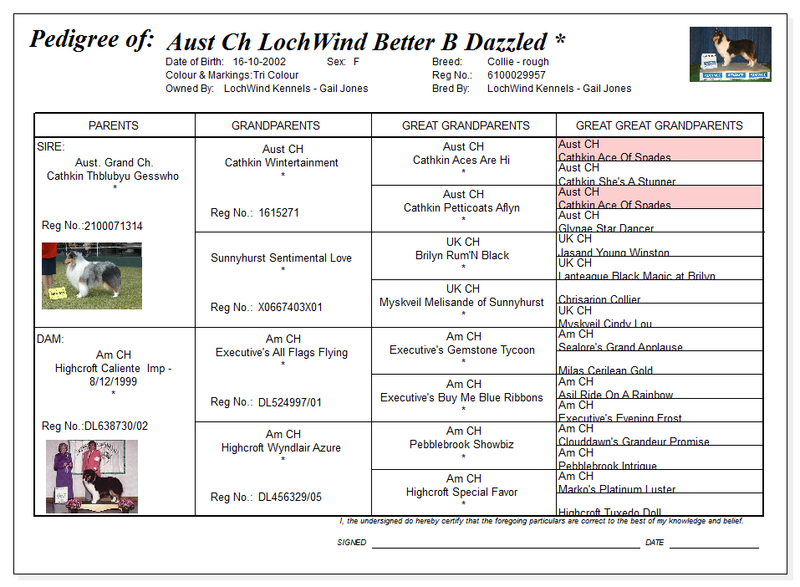 On the 10th July 2005 at the Winter Festival, Logie took Best of Breed, over her blue sister Ch LochWind Better B Witched. Logie went on to be Best in Group. 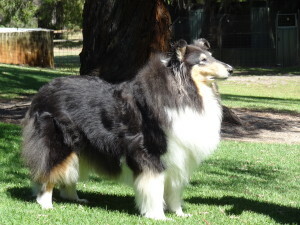 On the 21st August under collie specialist judge Jane Armatys (Keamaree Collies) Logie was Australian Bred In Show whilst her sister Lacey was Runner Up Best In Show and State Bred In Show. Logie is still with me as we move into 2015. I am hoping she is good for another year at least. 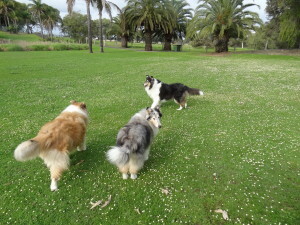 The girls still enjoy a romp around the lake.